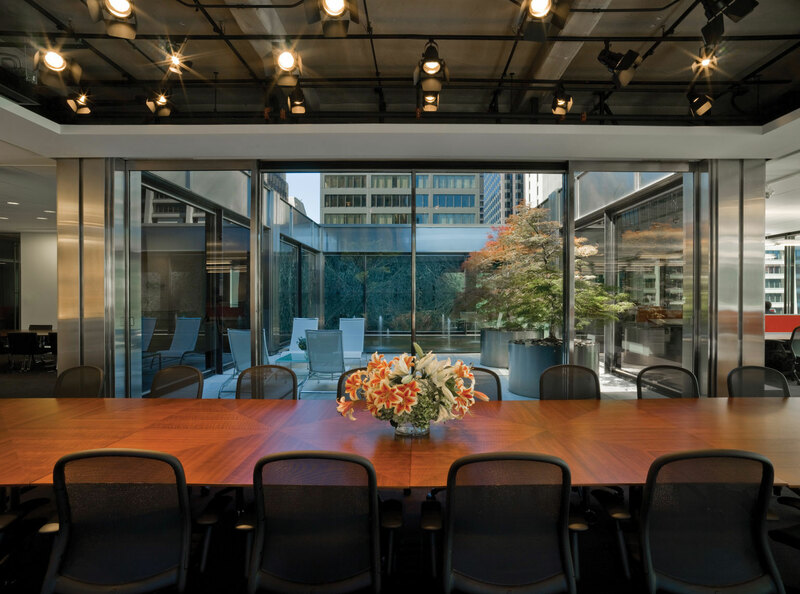 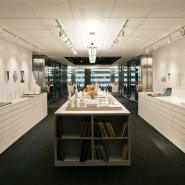 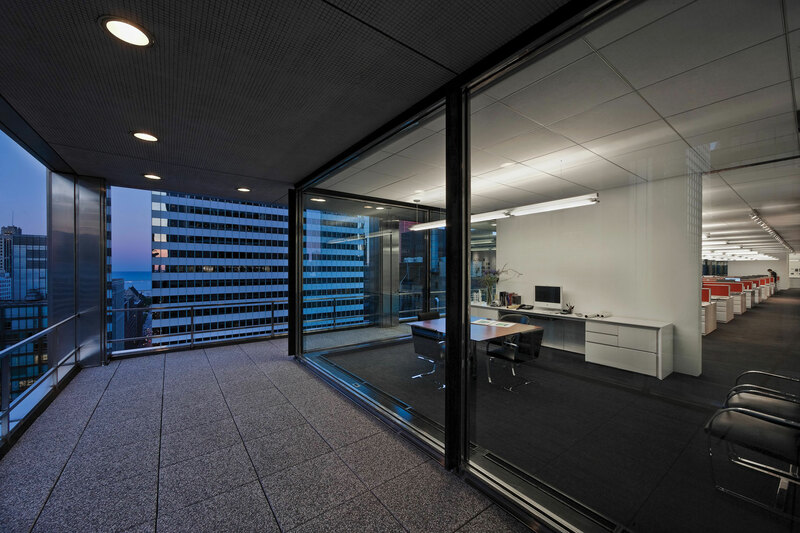 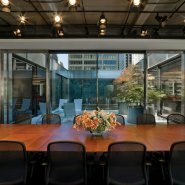 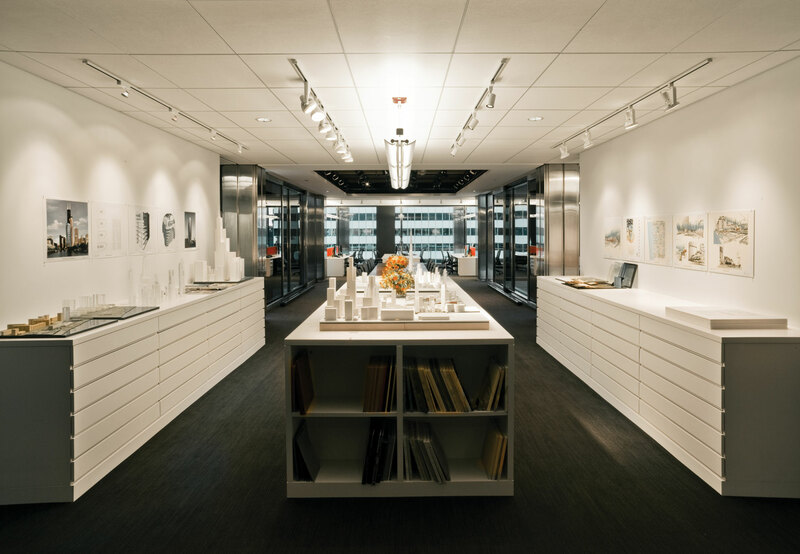 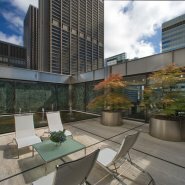 The offices of Adrian Smith + Gordon Gill Architecture provide a dynamic, collaborative workspace in the heart of downtown Chicago.The office is centered around two interior courtyard spaces. 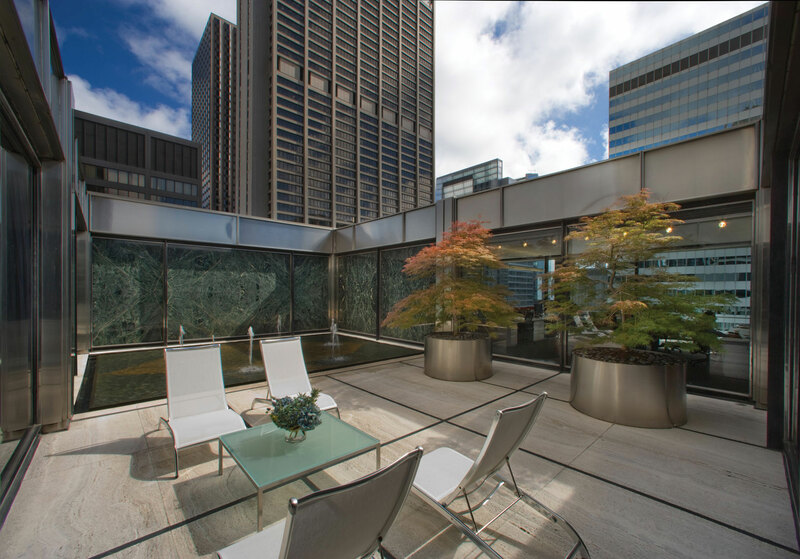 The courtyards, which both feature working fountains and greenery, function as central gathering spaces for staff and guests. 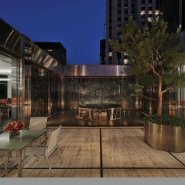 This close integration of the outdoor courtyard spaces promotes a reflective environment and supports the exploration of the balance between the built and natural environments, central to the firm’s work. 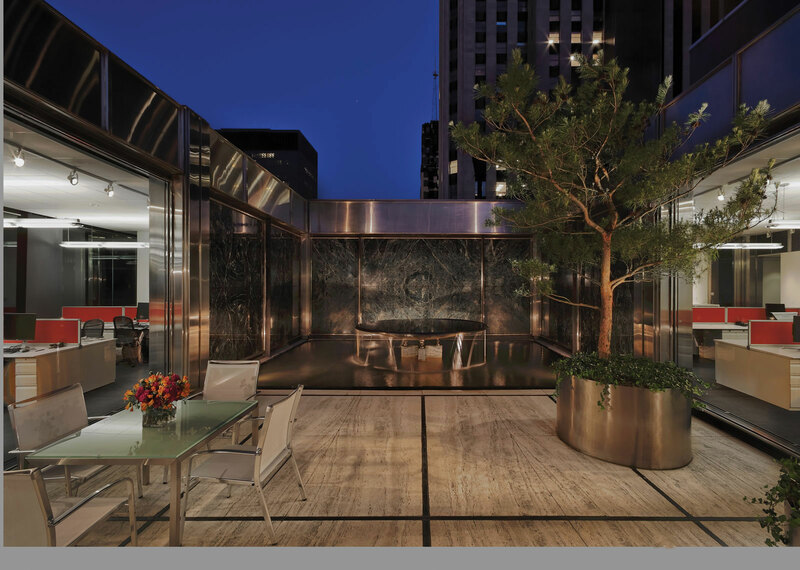 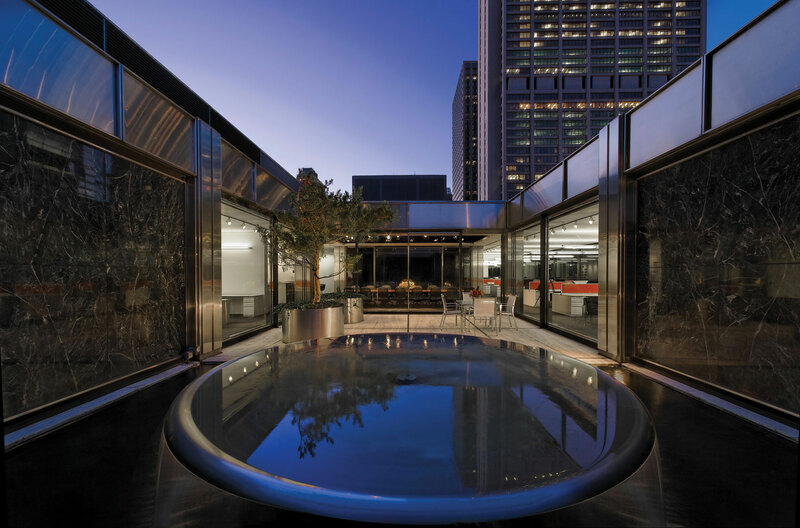 The office embraces the clarity of the modernist era, highlighting ‘found gems’ including the existing green marble, stainless steel columns, and courtyard and terrace spaces. 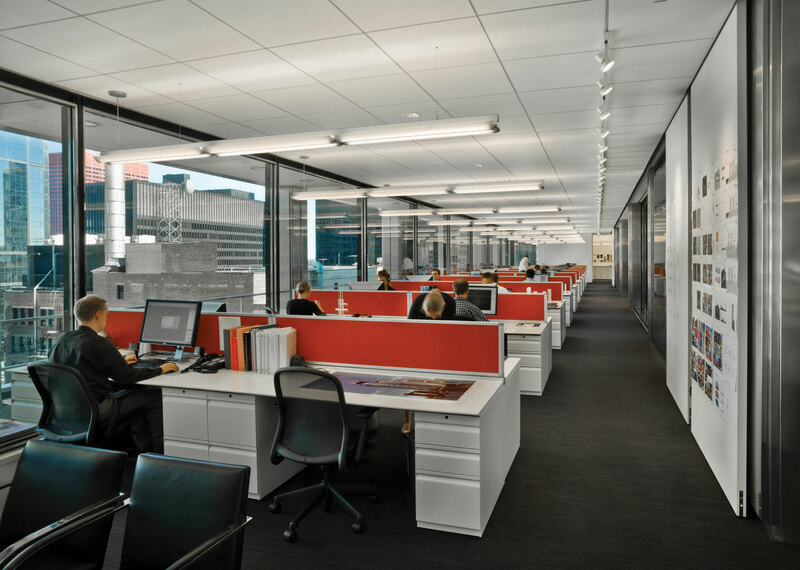 These elements are integrated with state-of-the-art technical systems and flexible work areas to create an optimal 21st century workspace. 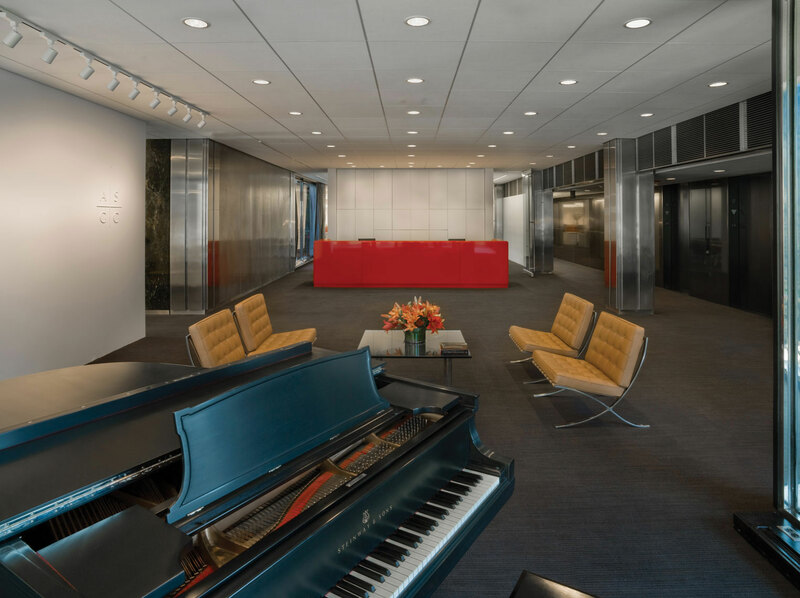 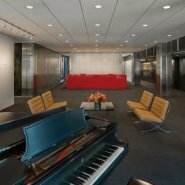 The warm color and tactile nature of the red fabric paneling and red color theme utilized throughout the office provide a dynamic visual contrast to the existing green marble walls and the modern, white work stations. 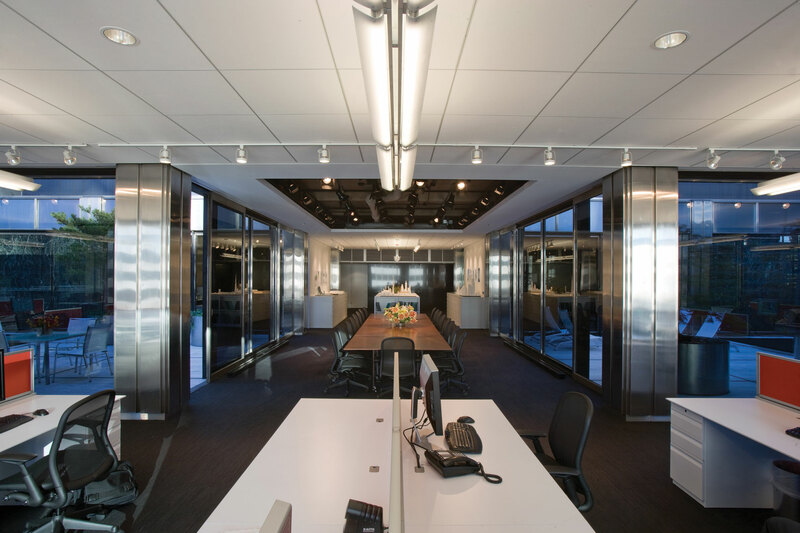 The fluid environment adapts easily to the changing needs of design teams. 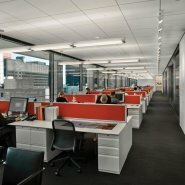 A series of panels for pin-up and review slide the entire length of the studio space, supporting the office’s collaborative, team-based environment. 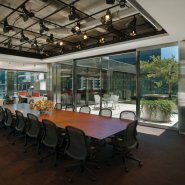 The central meeting space between the courtyards serves as the primary location for design discussion and review. 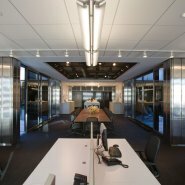 The ceiling area above the space was left unfinished to allow for the installation and testing of various ceiling systems, models and mock-ups for both interior and exterior building elements, supporting the space’s role as a “working lab” for the design teams. 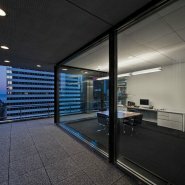 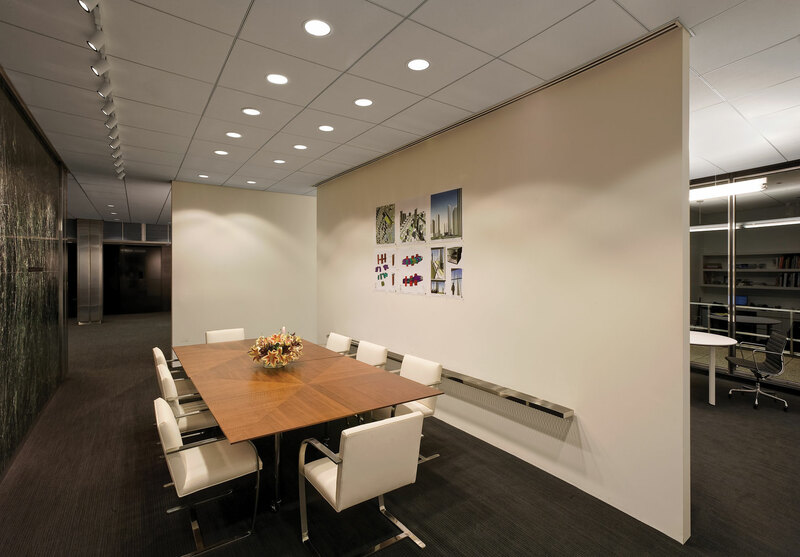 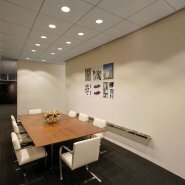 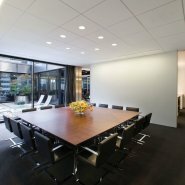 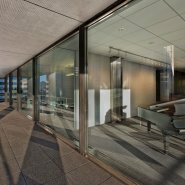 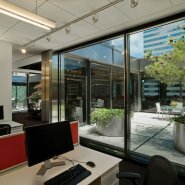 The office is designed to maximize daylight and city views in all interior workspaces, conference rooms, and the reception area. 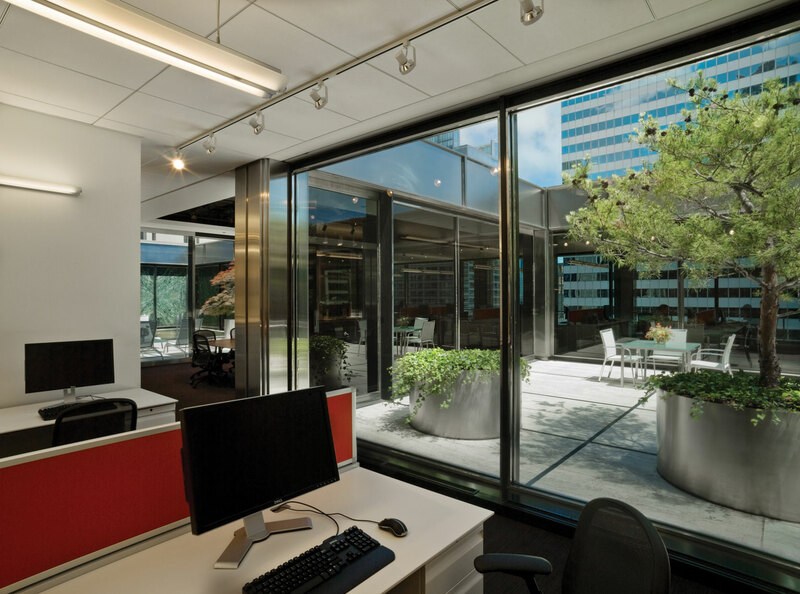 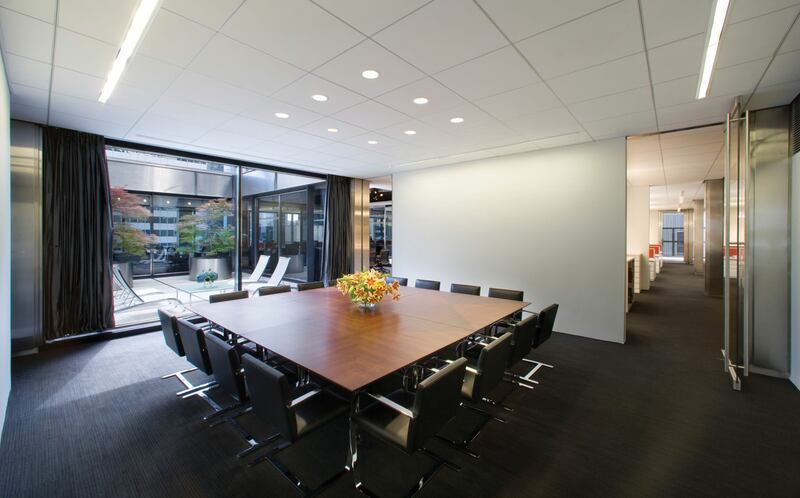 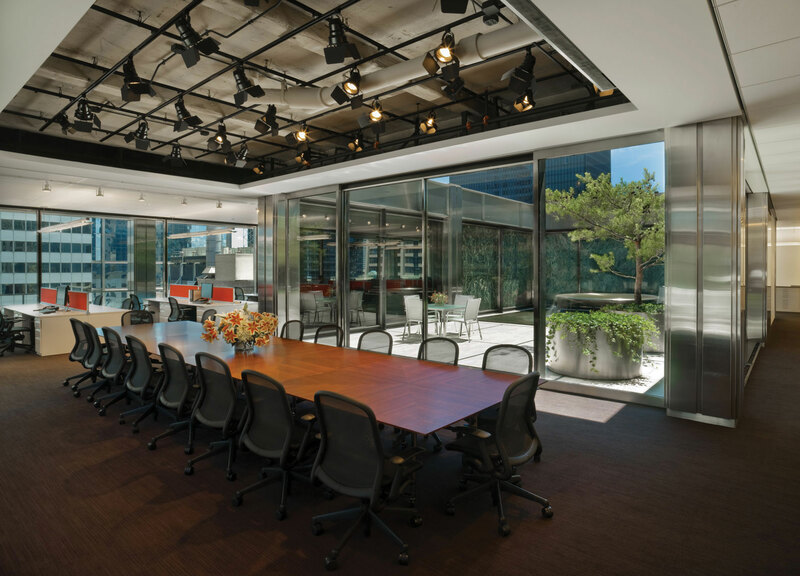 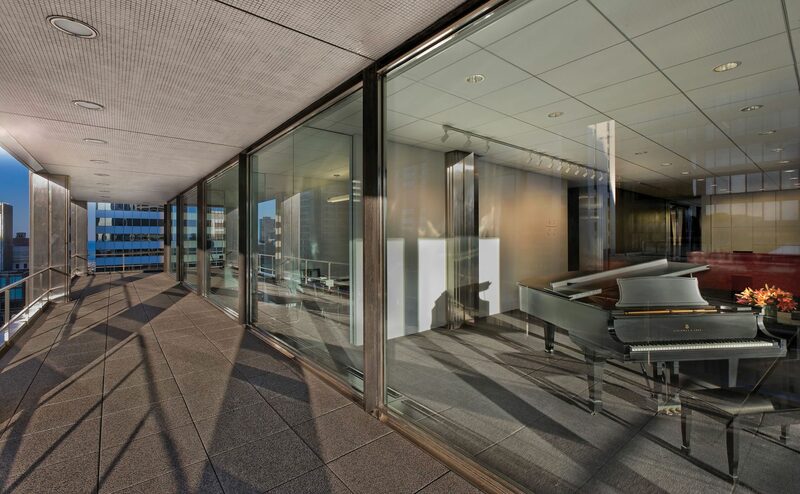 The space’s interior walls were removed from the exterior windows to maximize view corridors for staff; the abundant natural light also increases the space’s energy efficiency, which is further augmented by the use of dimmers and a radiant heating system.